The Zinzikon quarter in Oberwinterthur developed on agricultural land between the Eichwald forest and the core of the old village in the 1970s. Over the decades which followed, development in the quarter continued with mostly three-storey houses along Binzhofstrasse and Ruchwiesenstrasse with no urban development plan. 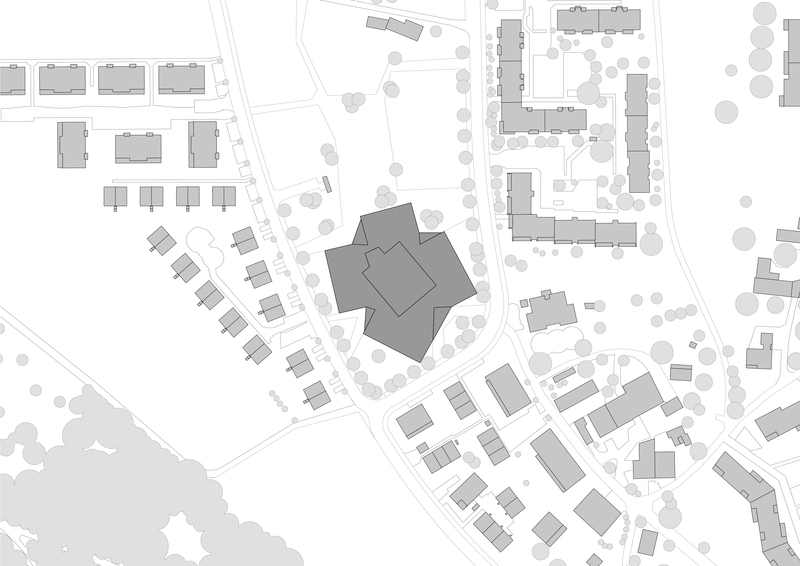 The central location of the property offers an opportunity to establish a social centre for the quarter with the school building. 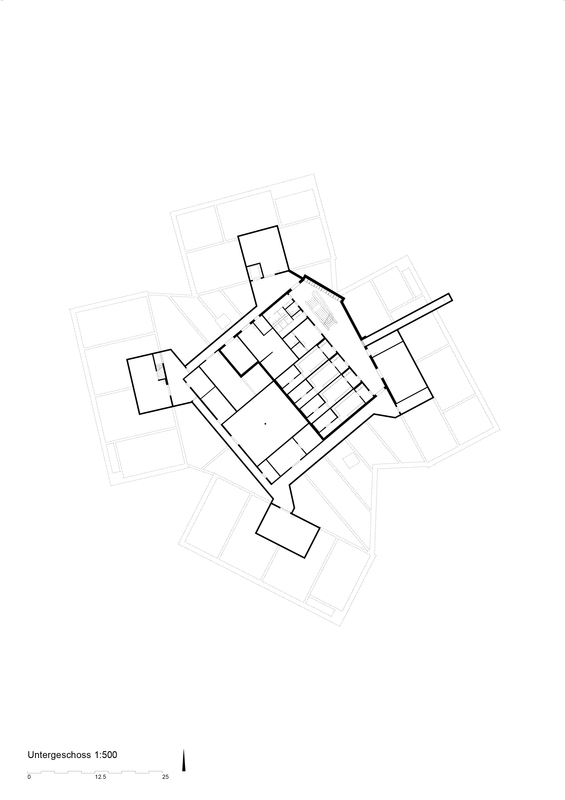 The schoolhouse as a flat structure with a reclined silhouette is embedded in the slightly rising topography between Binzhofstrasse and Ruchwiesenstrasse. With its striking horizontal extent, the school signals its public importance. The schoolhouse consists of individual building sections. 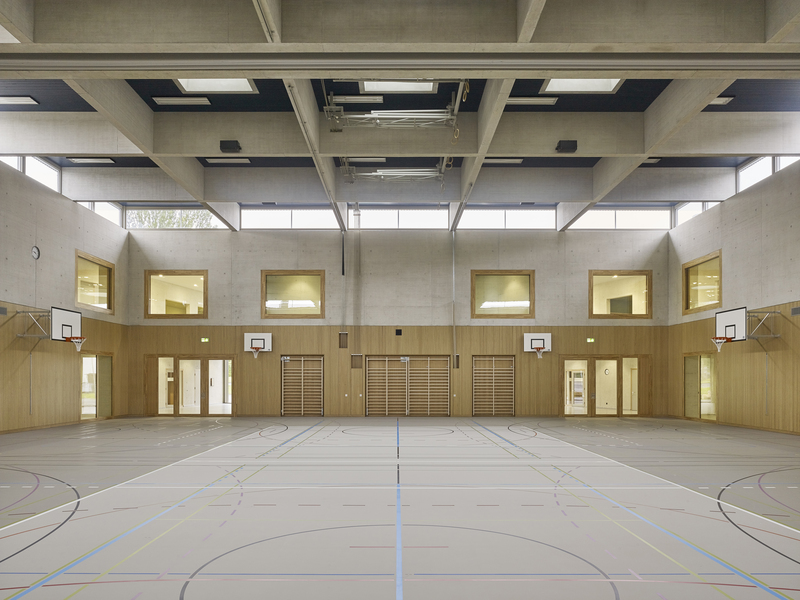 Four clearly defined, two-storey wings arranged around the central, double gymnasium in a fan shape are home to various school uses. 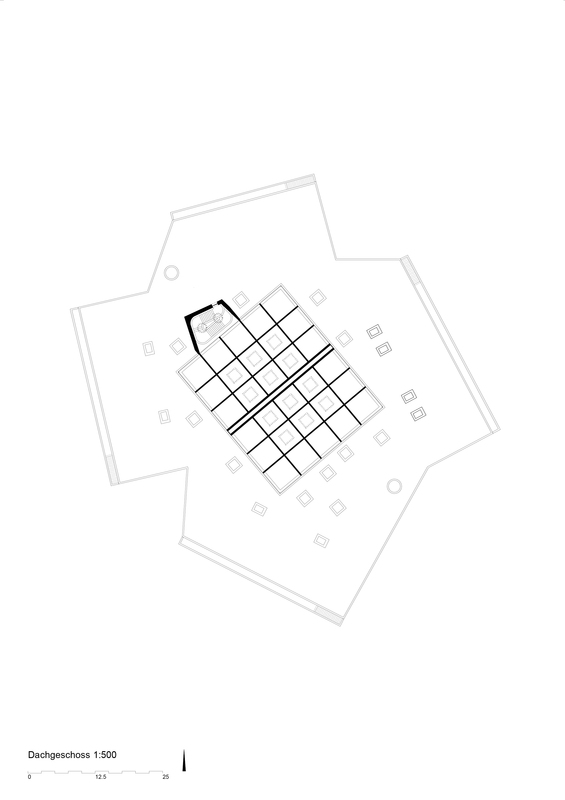 Notches identify the four entrances which link the school to the quarter on all sides. The school building with its concentric structure serves as the focal point of the residential quarter. 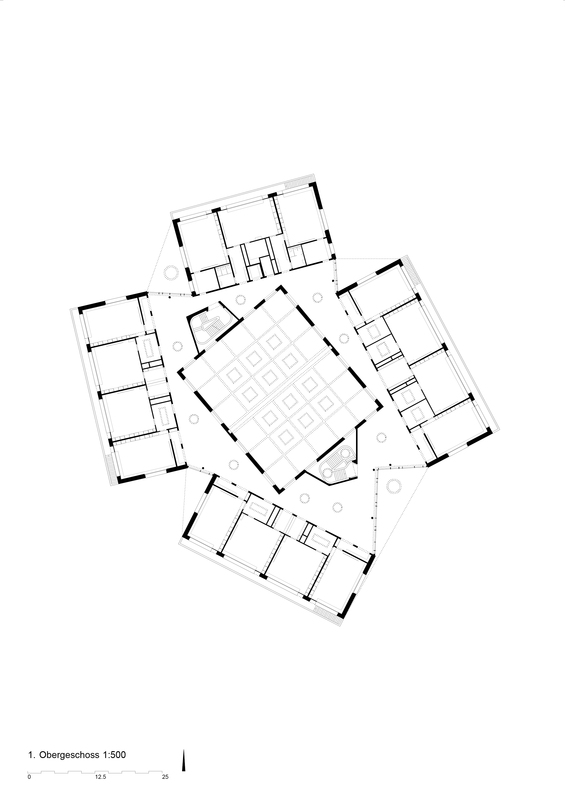 The elements of the floral structure are interconnected by the projecting, high roof to form a larger whole. 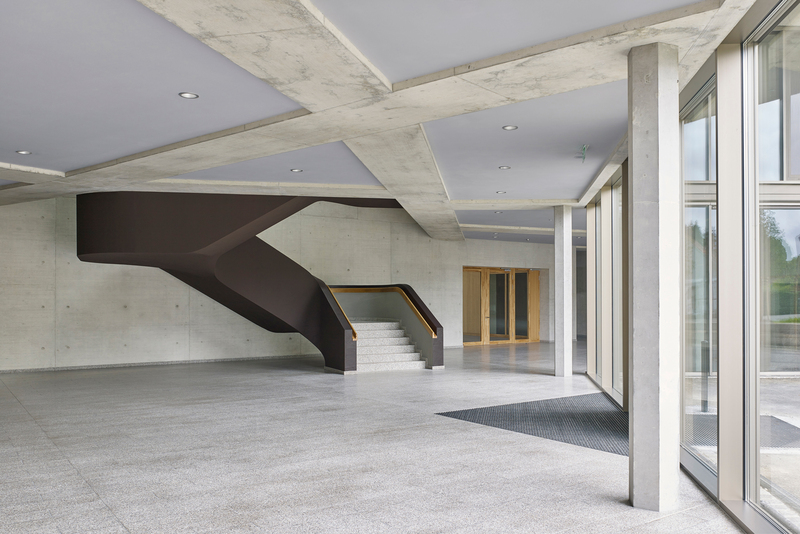 Building recesses and different textures in the fair-faced concrete structure the expansive building volume horizontally. In the area of the four entrances, the edge of the roof does not follow the notches but spans them, forming protective porch roofs. 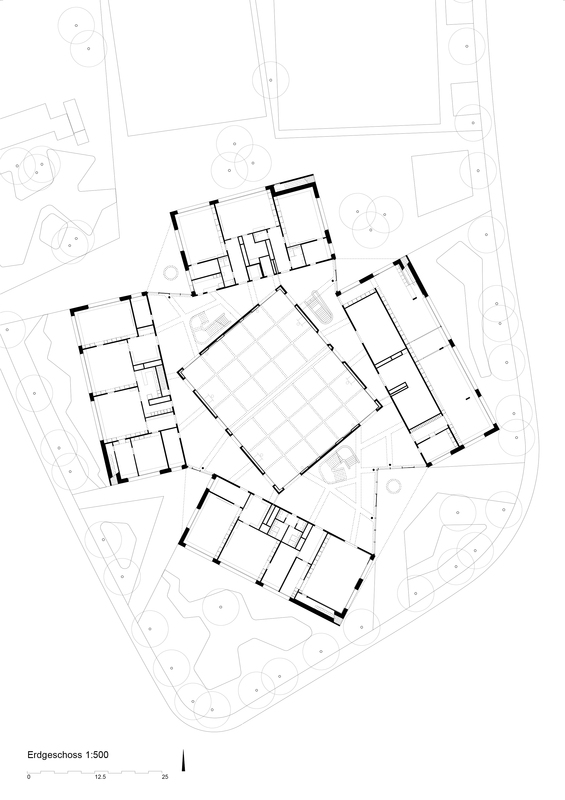 The underlying components of the schoolhouse remain discernible, establishing a scale tailored to children within the larger shared structure. 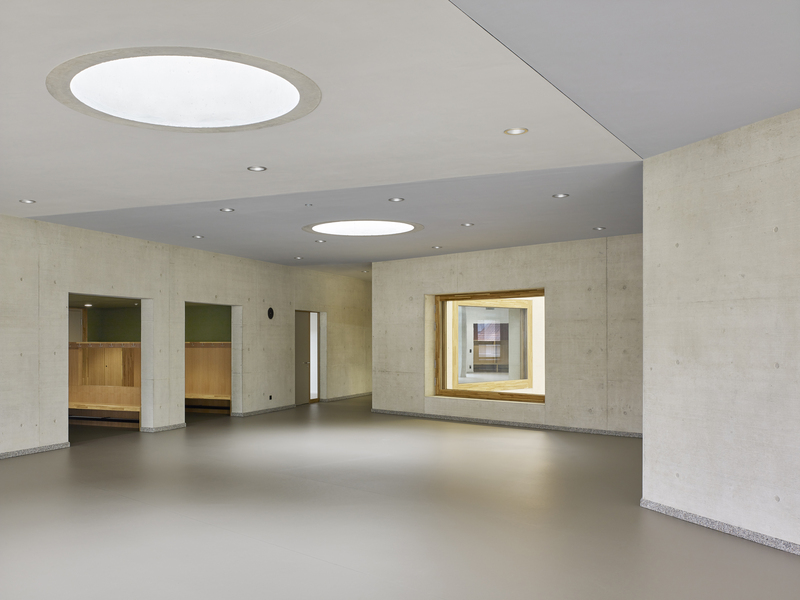 The result is a multi-layered whole in which the school can be experienced as a community and the child is able to perceive its individual school environment. The roofed entrances to the school are laid out in different sizes according to their significance. From the main entrance to the south, the key public uses such as the double gymnasium, music hall and school board are directly accessible. The north entrance forms the connection to the break area with all-weather pitch and playground. 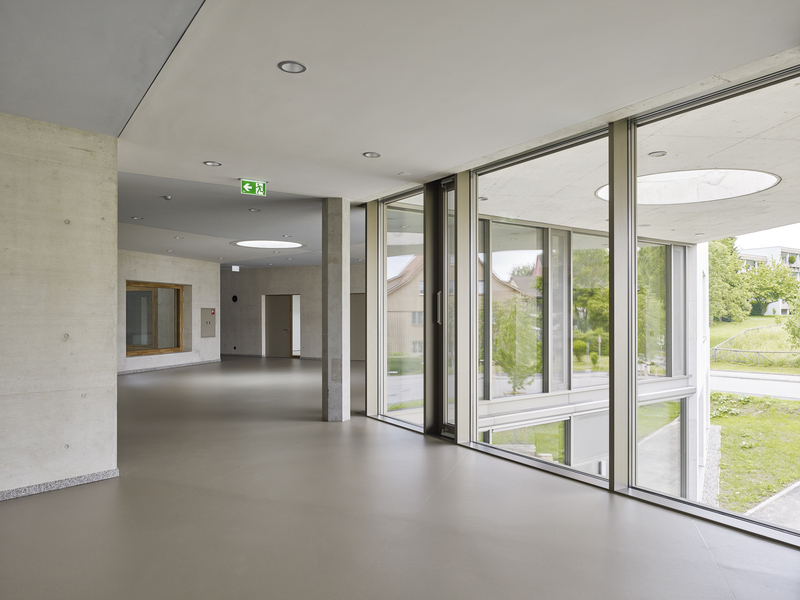 The entrance hall surrounds the double gymnasium and serves as the foyer for the entire school. 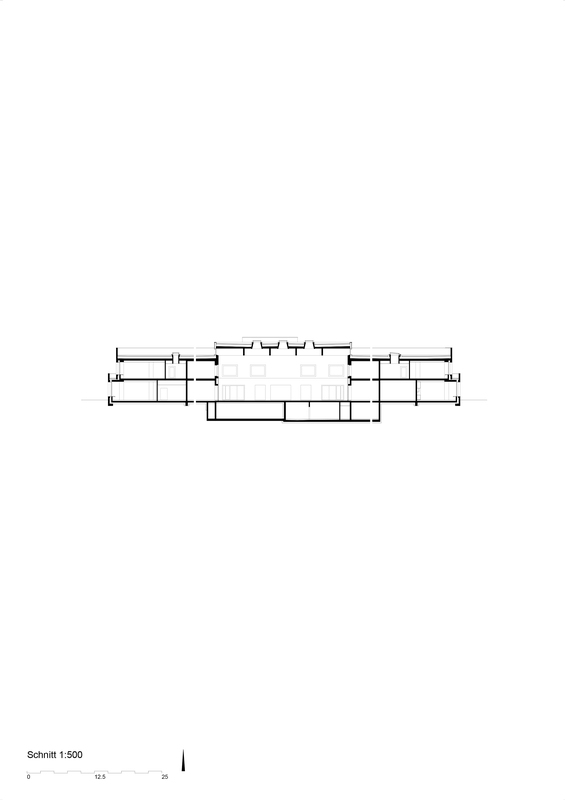 Thanks to the clustered arrangement the foyer, double gymnasium, music hall, day nursery and remaining rooms on the ground floor can be used individually or jointly according to the occasion. Prominently shaped stairs wind their way to the upper storey. The classroom and group rooms are found on the school’s upper storey. Teaching clusters are formed by four classrooms and two to four group rooms respectively. An external staircase leads from the classrooms directly outside. 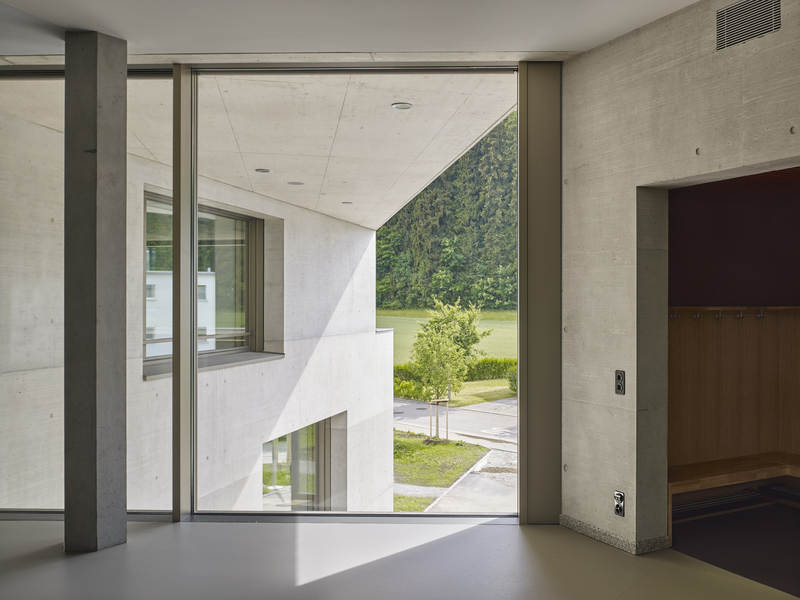 Since each wing is equipped with its own emergency staircase, the gallery between the double gymnasium and classrooms does not have to serve as an escape route and can be freely furnished. The room becomes a learning landscape for various types of schooling. 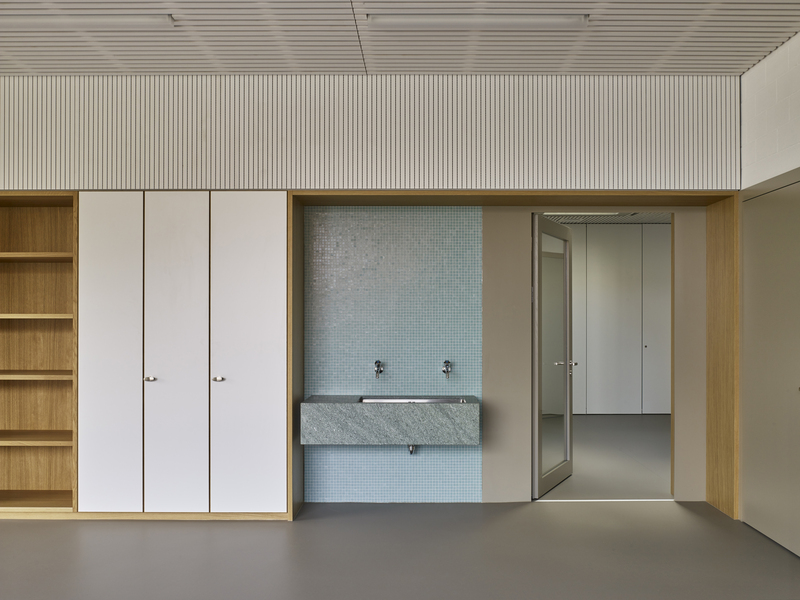 Open cloak room niches are arranged between the classrooms and the learning landscape. With their low ceilings and wine red, mustard yellow, olive and bottle green colours, the niches serve as spaces which welcome the children before classes begin. 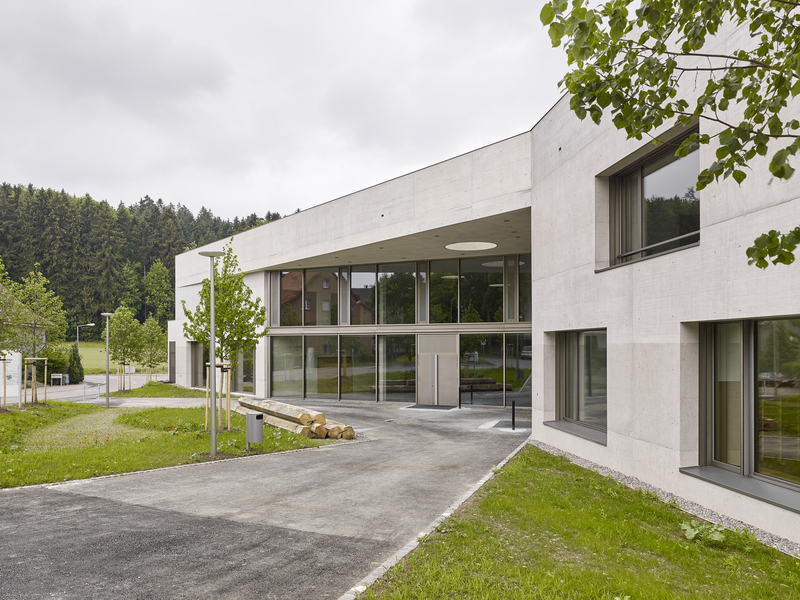 The building shell of the schoolhouse is made of fair-faced concrete. 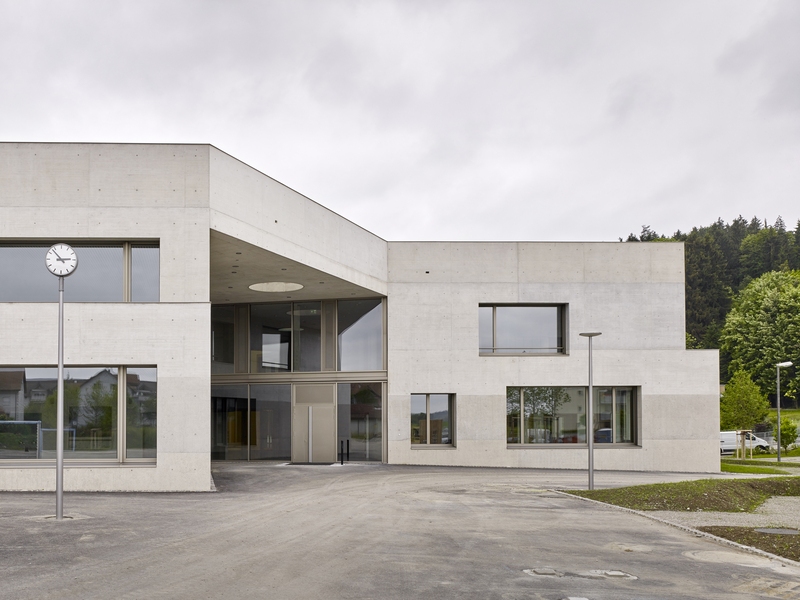 With this choice of material, the school follows a long tradition of schoolhouses made of fair-faced concrete. 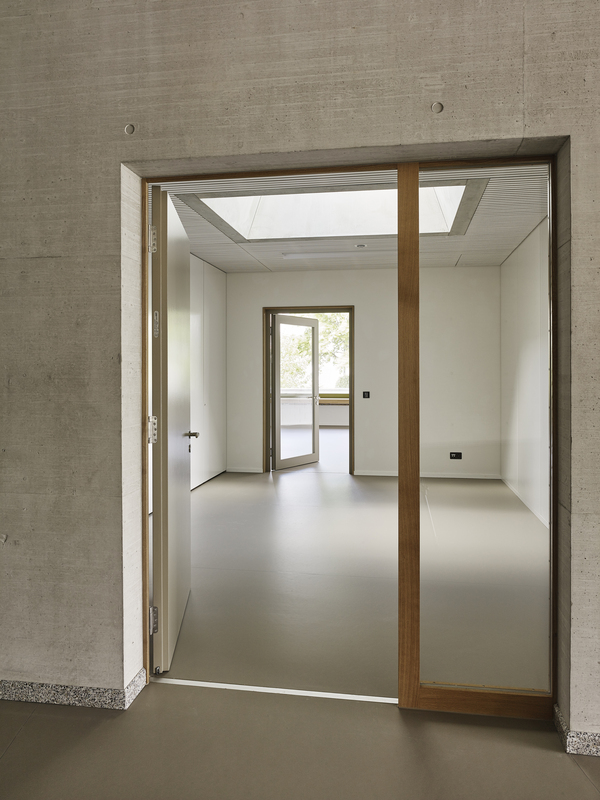 Fair-faced concrete is ideal for presenting the plasticity of the individual structures forming a whole.